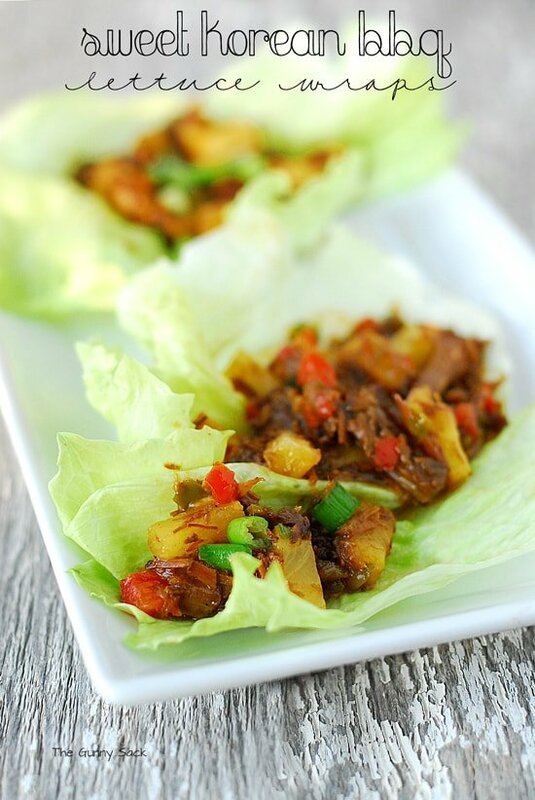 This slow cooker recipe for Sweet Korean BBQ Lettuce Wraps was made using Campbell’s Slow Cooker Sauce as part of a sponsored post for Socialstars by Crowdtap #CampbellsSkilledSaucers. Crock Pot Recipes make getting dinner on the table a little easier. With all of the holiday dinners, party appetizers and Christmas dessert, we still need to have our meals during the week. Between shopping for gifts, baking, writing Christmas cards, wrapping gifts and spending time with family and friends, all of our “extra” time is full to the brim with fun. So, how do you find time for family meals? I often use my slow cooker to make an easy weeknight dinner. In fact, while I am writing this post about slow cooker recipes, tonight’s meal is in the Crock Pot! 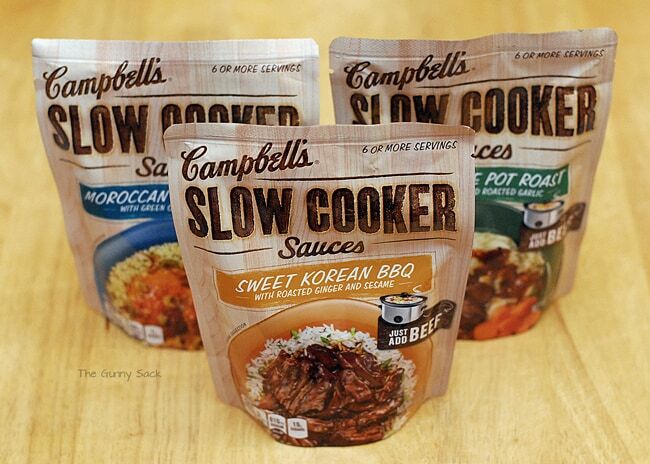 There are these great Campbell’s Slow Cooker Sauces that make using a slow cooker even simpler. 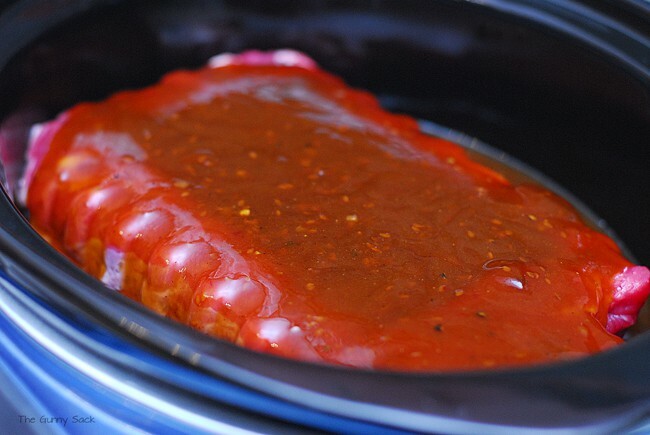 For this easy slow cooker recipe, I used the Sweet Korean BBQ Sauce. 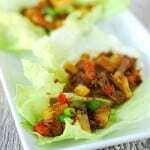 The beef can be served over rice or on tortillas but I decided to make Sweet Korean BBQ Lettuce Wraps. I love that the lettuce wraps can be eaten as a meal but they would also be served as an appetizer at a holiday party. Besides the Sweet Korean BBQ, Campbell’s Slow Cooker Sauces include Tavern Style Pot Roast, Hawaiian Luau, Moroccan Spiced Stew and Mexican Red Chile Taco. Making the meat couldn’t be easier. Place a 2-3 lb boneless beef chuck roast in the slow cooker and pour the sauce over it. It took about 5 minutes of prep time using the Campbell’s Slow Cooker Sauce! Cook on high for 4 hours. Using two forks, shred the beef and return it to the sauce in the slow cooker. Continue cooking on high for another 1-2 hours. Heat oil in a large skillet over medium high heat. Remove from heat briefly and carefully add a minced green pepper, a minced red pepper and the contents of the slow cooker. Return to burner and stir fry the mixture for about 15 minutes, until the sauce is reduced and peppers are cooked, adding a can of pineapple tidbits after 10 minutes. 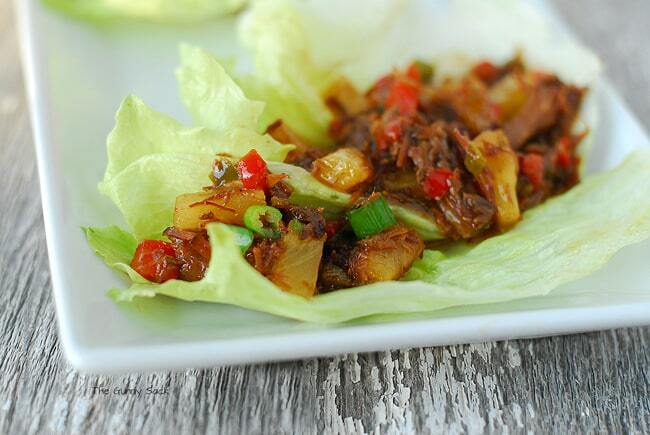 Serve the sweet Korean BBQ Beef in iceberg lettuce leaves topped with chopped green onions. Just wrap the lettuce leaf around the filling and eat it like a taco! 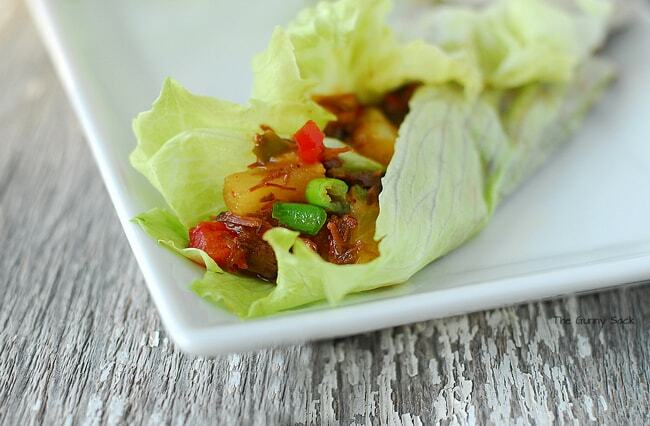 These Sweet Korean BBQ Lettuce Wraps didn’t have as much heat as I expected them to so if you like things hot, I would suggest adding some hot sauce or Asian chili sauce. This simply amazing weeknight dinner was easy to make with my Crock Pot doing most of the work and it was delicious! Place a 2-3 lb boneless beef chuck roast in the slow cooker and pour the sauce over it. Cook on high for 4 hours. Using two forks, shred the beef and return it to the sauce in the slow cooker. Continue cooking on high for another 1-2 hours. Heat oil in a large skillet over medium high heat. 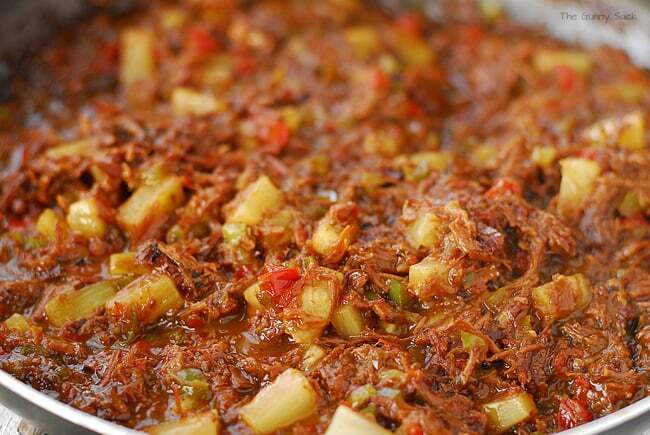 Remove skillet from heat briefly and carefully add a minced green pepper, a minced red pepper and the shredded beef. Return to burner and stir fry the mixture for about 15 minutes, until the sauce is reduced and peppers are cooked, adding a can of pineapple tidbits after 10 minutes. This looks so awesome! I’d love this for Christmas eve. I am asking for a new slow cooker for Christmas… This looks like a perfect recipe for it. My daughter has to buy a new slow cooker as we can not find her’s I saw it get packed when we were moving.We will make it as soon as she gets a new one tho. Thank you for shraing as it looks really good. These sound really delicious. With the holiday season keeping me so busy, I am definitely using my slow cooker a lot.